I've been itching to share this DIY for two weeks now. Hope you enjoy! Supplies: Cardigan, (mine was thrifted), lace. Pantry Supplies: Scissors, paper, sewing pins, sewing machine or needle and thread. 1. Take your cardigan and lay it out on the table with the back facing down. Place the lace down on the inside, making sure it is smooth with no wrinkles and pin it in place. 2. Turn your cardigan over so that the lace is now facing down. 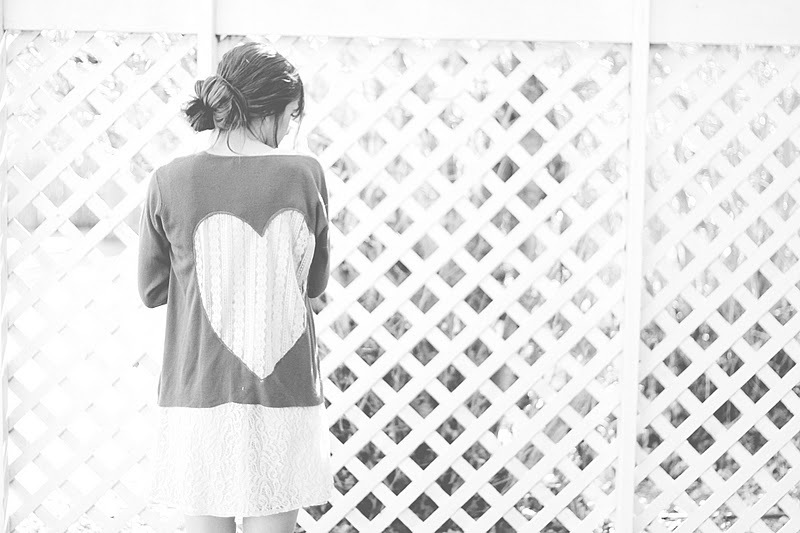 Take a piece of paper and cut out the size of heart you want and place it on your cardigan. 3. 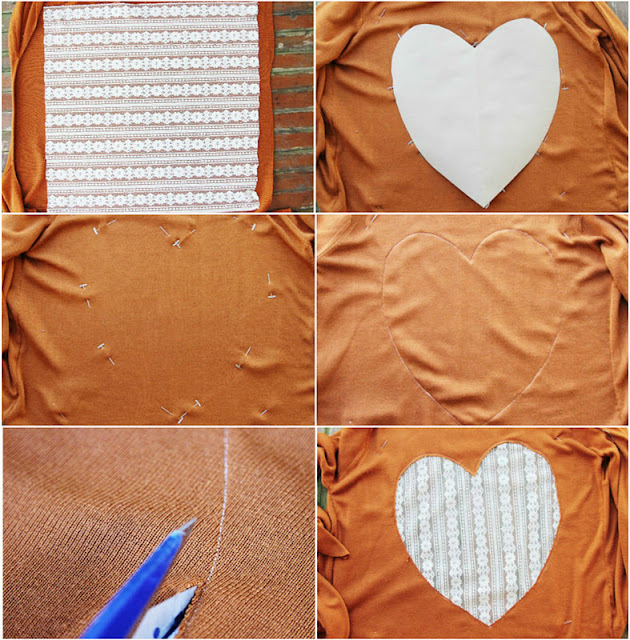 Take sewing pins and pin all the way around the heart. Be sure the pin goes through the lace as well. 4. Sew right on the inside of the pins to make your heart. Don't have a sewing machine? Don't be discouraged! Take the few extra minutes it takes to hand stitch it. :) 5. CAREFULLY cut out the heart on the inside of the stitching. Don't cut the lace underneath! 6. You're finished! Remove all the pins and enjoy your newly renovated cardigan. Wow! I will definitely try this! This is adorable! Making this! Holy cute!!!! Seriously it is not even fair that you are gorgeous and talented!!! wow i love this. :D thanks for sharing! I wish I had the guts to cut my own Cardigan to pieces. Still gathering courage! and I just got rid of a cardigan I was bored of...ugh, why didn't i think of this. that's amazing. plus, i had torn one of my cardigans and was too heartbroken to throw it away, but this is a great idea. thanks so much for sharing!! Definitely making this a sewing project with my new sewing machine. You are so cute and creative! Wow this is so pretty! I really need to start learning how to use my sewing machine! adorable! I will most definitely have to try this one out for valentines, perhaps on a sweater I no longer fancy. That is really sweet. I love the heart trend, especially with Valentine's Day coming up. Thank you for sharing this cute idea. I've just recently followed your blog, and it is becoming a fast-favourite of mine. :) This DIY tutorial has me itching to dig my closet for old cardigans! Thank you for sharing this. WOW! This is so lovely! really nice and creative! i am gonna try to put a red heart in a black cardigan! thanx for sharing this is a great tutorial! this is so cute! i absolutely love it and you make it look so easy! be sure enter my giveaway to win your very own shabby apple dress! this looks fantastic! can't wait to try it! stumbled across your pretty, pretty blog today and was instantly in love with it. got even more excited when I read your "about" page, and found out you love Jesus just like me! Can't wait to get to know you better through your blog. fantastic cuteness! thanks for sharing such a sweet and simple diy and just in time for valentine's day! Hi sweet Kinsey! I just found your blog from Elsie's. I read your "About" section and must say, I LOVE that I just randomly found out you and your hubby are believers in Christ! We are SISTERS! How rad is that. Anyway, that really encouraged me. Happy Thursday! I am a bit of a cardigan queen. One in every colour for everyday of the week. Soon I will have one with a pretty heart too! Found your blog and I love everything I see. This cardigan is amazeballs. I am going to have to make one this weekend. It's perfect with that burnt orange. 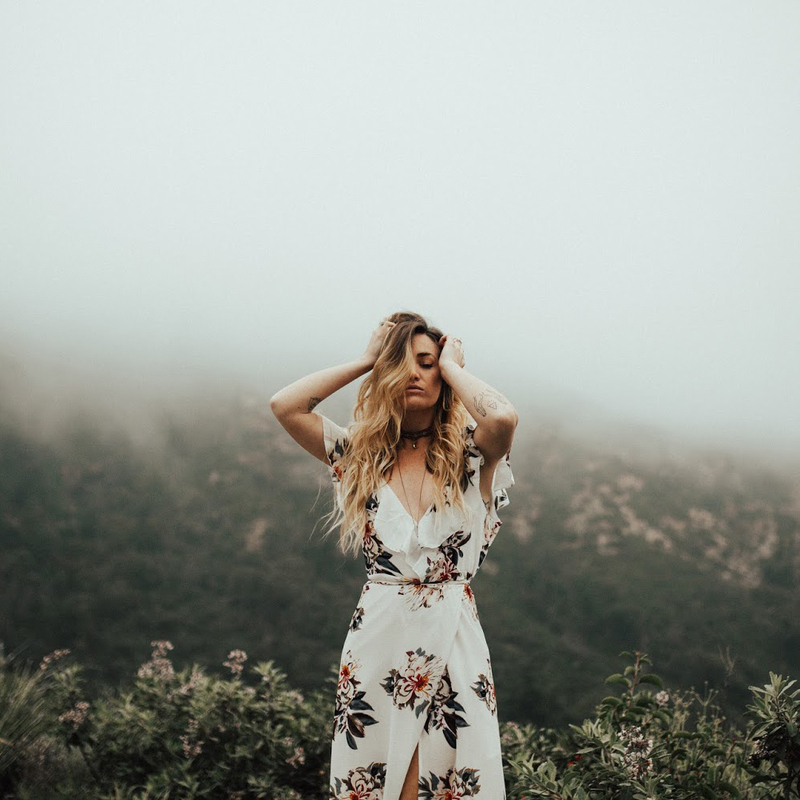 I loved this so much I shared it on my blog today! Everyone should see this! Found your blog and I'm loving everything I see. That sweater is perfect. The lace and burnt orange work so well together. Thanks for sharing! Had to share it on my blog today. I hope that's okay! Everyone should see this! That's such a good idea! I need to do this. Now just to find a cardigan I can chop up! I made this just in time for Valentine's Day, but I love it so much and got so many compliments that I just may wear it EVERYDAY! Thanks! I made this just in time for Valentine's Day, but I love it so much and got so many compliments that I just might wear it EVERYDAY! Thanks! I just finished this, it was so easy and the tutorial you gave was perfect! The only thing I changed was I made the paper heart and then traced around it directly onto my fabric with a fabric pencil and then hand sewed directly onto the line. Thanks Again! I'm so in love with your blog right now! Found you through pinterest and so glad I did! Lovely DIY!! This is an adorable project. Thanks for sharing. Uouu, it's amazing your creativity. I put link this post in my blog, ok? Congratulation your blog it's a very cute!